The thing to do is rent a scooter and go on your own. 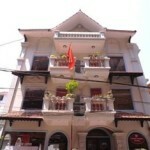 There are more than enough places offering you bike rentals in Sapa town proper. If you are good with motorbikes, you can do 30km each hour with good breaks to enjoy the view and stop at local shops and food places; top speed is 50kmph average going up and down the hills. You can do a bit better if you are alone but do this only if you are used to driving on winding hills and bumpy roads. Pay 10 dollars for a full day rental… you can get it for 6-8 as well. You don’t need a driver’s license here… passport is good and no one checks as far as you pay the entrance fees. If you are not confident of driving here (there are no rules apart from being the hills), fill up petrol from the gas stations as and when you require. But, if you can drive, you will get a better deal with a full tank… they will fill it up for the equivalent for 3 liters since they expect travelers to drive more than that ;-D Expect 30km or so per litre so work it out for yourself. The town is a nice start if you need a bit of time to get used to your bike. 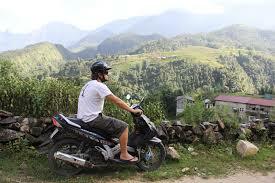 Enjoy roaming around places that are not already crowded with the usual group of backpackers and Hmong women. If you fancy it, you can make it to the entry point of Cat Cat Village. Bikes aren’t allowed in. Head off to Tran Tom pass which has amazing views of the mountains and beyond. The roads are even better to ride around after the pass as it gets progressively more into the hills and the forests. Come back to Sapa and make it to rice paddy terraces and then down to the valley floor of Ta Phin which inverts the views you just had… from the bottom instead of the top. 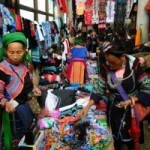 Better yet, instead of hopping on to a tour, take your motorbike to one of those remote Hmong markets in Bac Ha or Coc Ly and spend a few days out there. NOTE: Be respectful of the tribes. If you are part of a tour, they will take you to a lot of huts. Unlike the local guides, they don’t get a penny from your tours. They are just polite and don’t mind if you enter their premises but they do lead difficult lives. If you do enter their homes for travel purposes and showing pictures back home, do give them a bit in return.